By: Matthew Bernstein, Perkins Coie LLP. THE MAJORITY OF PATENT CASES ARE BROUGHT BY non-practicing entities (NPEs), also called patent trolls or patent assertion entities (PAEs). These parties litigate or license their patents but have no real products or services. NPE Lawsuits are commonly brought against U.S. companies and pose unique challenges. For example, many NPEs are represented on a contingent fee basis, and because NPEs do not have products, a defendant typically cannot level the playing field by asserting its own patents against the NPE. Whether you should litigate aggressively through trial or try to negotiate a quick settlement depends on your view of NPEs and the circumstances of the case. 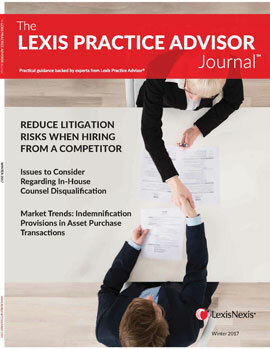 This article discusses possible ways to respond to an NPE presuit notice letter and complaint, discovery considerations, and how to approach settlement negotiations. Early dismissals. Dismissals in federal litigation before responsive pleadings suggest the NPE is likely looking for a quick, nuisance value settlement. Dispositive motions. Motions to dismiss and summary judgment motions may indicate potential arguments relevant in the current matter. Claim construction filings. Claim construction filings can provide insight into the scope of the asserted patent (i.e., how broadly it is being applied). Invalidity contentions. Obtaining invalidity contentions from earlier proceedings, and the underlying prior art, may jump-start your invalidity case. Expert reports. Knowing that the previous case reached the expert report stage means that the NPE is willing to litigate instead of just looking for a quick settlement. The existence of expert reports means that defenses were investigated to their final or near final form, and obtaining these reports through the discovery process could jump-start or at least help your case. Other accused infringers. Defendants in other pending cases who share a common interest with your client (defeating the NPE) may be willing to pool resources and share the costs of the defense. See Joint Defense Groups later in this article. While a notice letter may start the clock running for damages and constitute notice for enhanced damages, you are not legally required to respond to a notice letter. Some companies choose not to respond, wanting to first see if the NPE will actually sue or follow up with a second letter. Conducting research on the NPE’s history of bringing lawsuits is useful on this point. See Research the NPE above. But understand that if you are sued without ever responding, the NPE will raise this fact in its request for enhanced damages. Regardless of your response approach, you still should evaluate the risks posed by the asserted patent in light of the Supreme Court’s decision in Halo Electronics v. Pulse Electronics, 136 S. Ct. 1923 (U.S. 2016), which may make it easier for NPEs to recover enhanced damages. Some companies enter into negotiations with the NPE after receiving a pre-suit notice letter, hoping to avoid protracted and expensive litigation. Discuss this possibility with your client and consider whether and when to engage in negotiations with the NPE. For a discussion on negotiations, see Negotiating with NPEs later in this article. After receiving a notice letter, one option is to file a declaratory judgment action in your home jurisdiction alleging that your client did not infringe and/or that the asserted patent is invalid. This may help to keep the case out of the Eastern District of Texas, where many NPEs file suit. While probably not the overwhelmingly plaintiff-friendly jurisdiction it once was, the Eastern District of Texas remains a tough place to defend a suit. While most IPR requests are filed after an NPE files suit, you may file an IPR request before the NPE files. This is an even more aggressive strategy than filing a declaratory judgment action because of the costs associated with preparing and filing for the IPR. It is fast (six months from filing to institution, and then one year from institution to a final written decision). It places the issue of invalidity into the hands of highly trained, technical PTAB judges as opposed to a lay jury or a district court judge with limited patent or technical experience. The PTAB often sides with the accused infringer. Costs are substantially less than litigating through a district court trial. IPRs put pressure on the NPE because the asserted patent is subject to an invalidity challenge that will likely get decided before any parallel district court case goes to the jury. Even where a favorable NPE jury verdict comes first, if the IPR invalidates the patent before final judgment after all appeals, then the PTAB’s invalidity finding nullifies the jury verdict. Also, NPEs often hire litigation counsel on a contingent fee basis for litigation but retain inexpensive or inexperienced counsel to defend against an IPR. Even the thought of having to defend an IPR could bring an NPE to the settlement table. A precondition to filing a winning IPR is finding good patents or printed publication of prior art. An IPR will likely be unsuccessful if the prior art is not good. If there is even a possibility you will file an IPR, start looking for prior art as soon as possible. Cost. You may want to consider not filing an IPR request if the costs will exceed your potential exposure in the case or the amount for which you could settle the case. Stay not guaranteed. Some companies decide against filing IPR requests because they want to avoid having to concurrently litigate in two forums—the result if the district court case is not stayed after filing the IPR. While some courts routinely grant motions to stay after the filing of an IPR request, others deny them or only grant the motion if the PTAB actually institutes the IPR six months after filing. Estoppel. If the PTAB in its final written decision finds a patent claim valid over the prior art, then the defendant is estopped from raising in the district court the prior art that it raised, or that it reasonably could have raised, in the IPR. 35 U.S.C. § 315(e). While the law is still unclear on what “reasonably could have raised” means, there is at least a chance that a defendant could be precluded from using any prior art patents or printed publications at the district court. The defendant could still raise other invalidity defenses (for example, 35 U.S.C. §§ 101 or 112, or prior art systems), but losing at the PTAB essentially guts an invalidity defense in litigation. There are other grounds for moving to dismiss (such as lack of personal jurisdiction), but those are not particular to NPE cases. Section 101 concerns patent-eligible subject matter. While abstract ideas that are not inventive are not patentable, these patents do issue, and NPEs often obtain and assert these types of patents. If defending such an action, consider filing a Rule 12(b)(6) motion to dismiss under Alice Corp. Pty. Ltd. v. CLS Bank Int'l, 134 S. Ct. 2347 (U.S. 2014) and all of the related Federal Circuit cases invalidating these types of patents. Filing an early and strong Alice motion is a good strategy because it puts immediate pressure on the NPE to spend money defending the motion. Defendants frequently move to dismiss based on the NPE’s failure to sufficiently plead infringement or willful infringement under Twombly and Iqbal, which require allegations to state a “plausible” claim for relief. See Bell Atlantic Corp. v. Twombly, 550 U.S. 544 (U.S. 2007); Ashcroft v. Iqbal, 556 U.S. 662 (U.S. 2009). NPEs tend to file bare-bones complaints lacking any detail, parroting the language of the patent statute and the asserted patent without providing much factual detail specific to the accused infringer. Indirect infringement (inducement and contributory infringement) allegations are particularly susceptible to these types of motions, and with the abolishment of Form 18,1 challenges to direct infringement allegations will likely increase. The Supreme Court’s recent decision in Halo Electronics may impact how and when a motion to dismiss can be made against a willful infringement claim. While defendants have prevailed with these motions (especially on indirect infringement), and they require the NPE to expend resources in opposition, their value is questionable because dismissals are almost always granted with leave to amend. So, while you may win the motion, and the NPE may have to provide more detail in an amended complaint, the case will typically not be over. Additionally, keep in mind that some courts, such as the Eastern District of Texas, often will not stay any discovery or other case deadlines pending resolution of a motion to dismiss on insufficient pleadings. Determine how your judge treats these motions before making the decision as to whether to file this type of motion. If there is no legitimate argument in support of dismissal (either Alice or insufficient pleadings), or if the client does not want to spend the money on a motion, you must answer the complaint. The answer contains the defendant’s responses to the complaint’s allegations, its affirmative or other defenses, and any counterclaims, cross-claims, or third-party claims the defendant intends to bring. Before drafting the answer, coordinate with your client and conduct a reasonable inquiry into the complaint’s allegations to respond in good faith. FRCP 11(b). Before including counterclaims with your answer, check the local rules to see if including these would result in your having to bring employees for deposition to the district where the case is pending as opposed to where they reside or work. Decide whether to move to transfer early in the case to avoid having delay be a basis for denial. Conduct thorough research on the possibility and potential benefit of a transfer. See Research the Court above. The costs of filing a transfer motion can be considerable, consisting not just of the expense of briefing but also any venue discovery sought by the NPE. Additionally, do not expect the NPE to stop prosecuting the case while the court considers whether to transfer. Your transfer motion should not rely on general statements, but should identify with specificity how the parties and especially third party witnesses would benefit from a transfer to the desired venue. Enter into an NDA. Enter into a nondisclosure agreement (NDA) that protects your confidential and proprietary information and applicable settlement communications. Share favorable exposure points. This will likely be more persuasive than good prior art or a strong noninfringement argument. For example, if your U.S. sales are minimal or the accused product is at the end of its life, the NPE may drop the case or settle for even less. Request information on other licenses. Ask the NPE to provide the names of companies that have taken licenses and the terms of those licenses to determine whether the terms you are being offered are reasonable and whether your competitors are among those that have taken a license. Even if confidentiality provisions apply, the NPE should still be able to provide ranges or some general data points. Consider the terms of your own licenses. If you have licenses for similar patented technology, use them to estimate a reasonable royalty. If you are under an NDA and the agreements are favorable to you, consider sharing the details with the NPE. Identify any industry reasonable royalty. Conduct research into any publicly available royalty / royalty rate information for similar patents or technologies (so-called industry norms). Also, push the NPE to provide a detailed infringement claim chart. NPEs often simply claim infringement without giving any details or provide a hastily put-together claim chart that was used for dozens of other companies with little change. Make the NPE spend the time and money to specifically identify how your client infringes. Consider sharing any strong noninfringement argument with the NPE (under an NDA), but know that NPEs typically do not give much weight to a piece of prior art at this stage, given the presumption of validity and the time it takes to invalidate a patent with prior art. You should still notify the NPE that you are willing to use the prior art to invalidate its patent, especially if an IPR is part of your litigation strategy. If applicable, also articulate Alice / Section 101 deficiencies in the asserted patent, especially if the patent is similar to any invalidated by the Federal Circuit. Loss of control. While it is possible for JDG members to take differing positions prior to trial, from a practical standpoint these instances are rare given the NPE’s ability to take advantage of the differences. This results in JDG members compromising on issues with the other members. Shared discovery. Not every defendant, for example, may get to depose the inventor or NPE. The joint defense agreement (JDA). Negotiating the JDA, also referred to as a common interest agreement, can be tedious and time consuming. Issues for the JDA include what can be done with prior art provided by a JDG member or found as the result of a search paid for by the JDG, and what happens when an individual JDG member settles. Rule 26(f) of the Federal Rules of Civil Procedure requires federal litigants to confer early in a case to develop a discovery plan and submit a written report to the court outlining the plan. The conference generally occurs before discovery begins and aims to streamline the process and avoid discovery disputes. If you belong to a JDG, consider your individual discovery needs. Much of the discovery is shared among the JDG members, such as the interrogatories and deposition time, including Fed. R. Civ. P. 30(b)(6) and expert deposition time. To protect your client’s interests, push for as much individual offensive discovery as possible, and include explicit language in the Rule 26(f) plan for such discovery above and beyond what the JDG has proposed as a whole. In addition to deposing the inventor and the NPE’s 30(b)(6) witnesses, ensure that you have separate time to depose the NPE’s infringement and damages experts, since those opinions are specific to your case. You should also push the NPE for its positions on conception, reduction to practice, priority claims, and other issues that require the NPE and its counsel to do work digging up witnesses and evidence, unless the NPE will concede the issues. Inventors often have at best a loose relationship with the NPE, and sometimes they are openly hostile to the NPE. For NPEs that failed as real businesses, digging up records and source code, as well as friendly witnesses, can be difficult, but you should push for this discovery. Conception and reduction to practice (i.e., the invention story) is a key theme for a patent plaintiff at trial, and it is a theme NPEs often struggle with if they do not or cannot make considerable effort prior to and during the lawsuit. Some NPEs are content with just the discovery they actually need, but many others propound burdensome, unnecessary, and unreasonable discovery solely to harass the defendant into settling. Push back against this, and do not be afraid to go to the court to resolve discovery issues if the NPE is unreasonable. Rule 26 specifically calls for proportionate discovery, and most NPE patents relate to a small feature of a product. If the NPE serves discovery requests on a dubious damages theory, consider raising it with the court or moving for summary judgment on damages-related issues. Even if you lose, you can educate the judge on the issues, facts, and law. Also, do not hesitate to file Daubert motions to exclude questionable expert damages opinions, such as for improper use of (or complete failure to use) the entire market value rule, the comparability of relied upon licenses, and foreign sales. Patent damages law has been trending pro-defendant, and accused infringers facing an NPE seeking unreasonable damages should challenge the NPE at all opportunities. See, e.g., LaserDynamics Inc. v. Quanta Computer, Inc., 694 F.3d 51 (Fed. Cir. 2012). Matthew Bernstein is the managing partner of Perkins Coie's San Diego Office, co-managing partner of the Taipei office, and a partner in the firm's Patent Litigation Group. His practice focuses on patent litigation and patent trial work. The views and opinions set forth herein are the personal views or opinions of the authors; they do not necessarily reflect the views or opinions of the law firm with which they are associated.